The smallest forklift that I have built, features drive, steering, lifted and tilted fork. Including pro-building instructions. 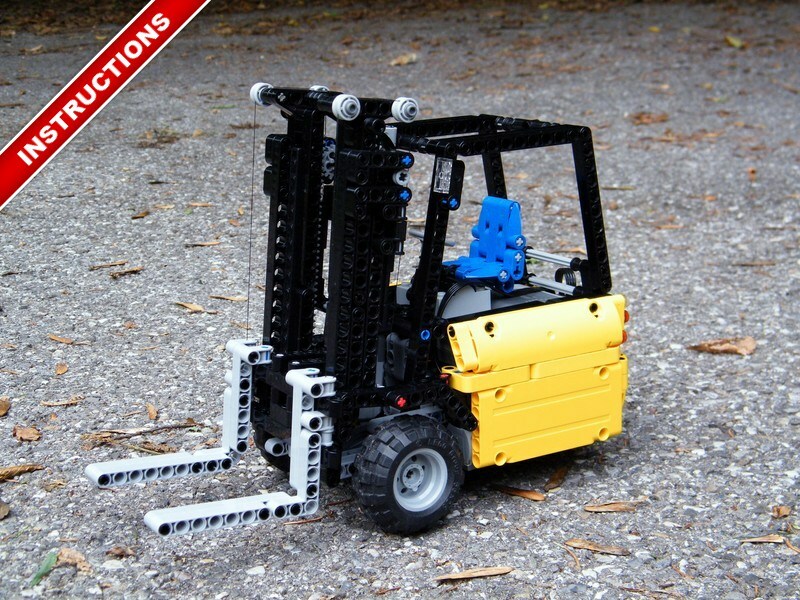 The aim was to built the smallest forklift features all functions. A XL motor drives the front wheels with a 8/24 and 20t on differential. The use of new frame enable to have a strong building, without creaking sounds. The steering is operated by a M-motor, with a worm gear and clutch. I have chosen the single steering wheel in order to have a very small construction. Therefore, the frame measures 12cmx17cm. The tilting of the fork is operated by a M-motor with worm gear and a clutch. 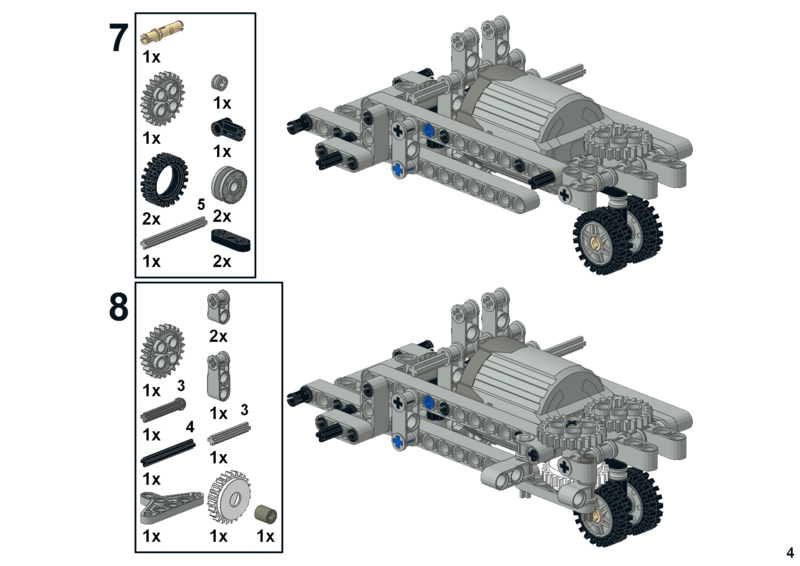 The fork is build on a variation of the fork of the 8416 set. Mine raises the fork at 24cm. I have tried to keep in mind to have a good design with yellow panels and I think I succeed, the forklift truck is small and very playable. About the building instructions, I have drawn the forklift on SR3D builder, then I created the instructions with mlcad and Lpub4.0, the renderer is Ldglite. The result is a success, make building instructions become easier with SR3D and Lpub4.0, what encourage me to make more building instructions (as you can notice). As I said I have made pro building instructions. As usual, you can buy it for 5€ and then download the instruction immediately. Here is the complete bill of material on rebrickable. Note that you have to attach two string on each side of the fork-arm. One extremity to the fork (on each side), other extremity on the base of the arm, by passing in the two pulley. Peux t’on remplacer le recepteur par une Sbrique et si oui ou peux t’on la trouver au meilleur prix ? Could you explain or send me a picture, about how you attached the rope that lifts the fork? The building instructions are available on the post and works fine. We were wondering on step 12 how you attach the battery box. 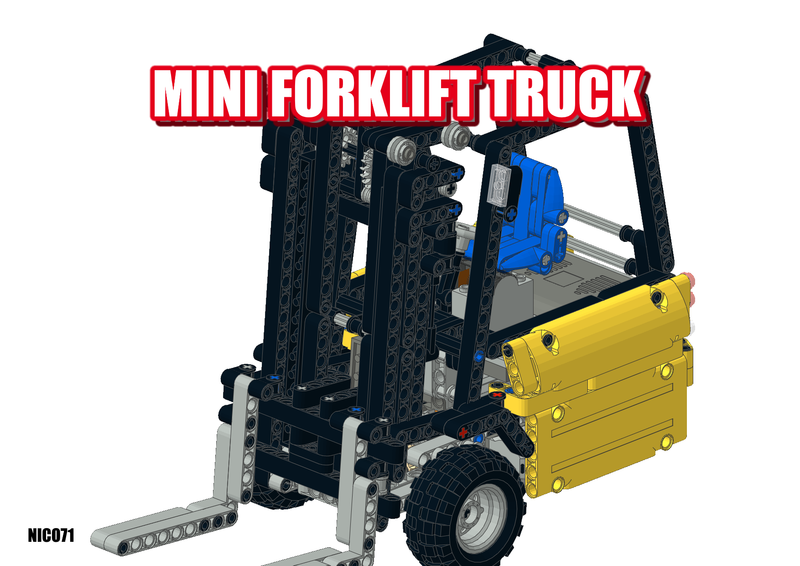 Hello, I’m doing a project at school and I wanted to know if I can do only the forklift part with a Lego NXT Mindstorm kit (I’m not really familiar with it yet). I wanted to add it to another robot for a project. What do you mean by scale ? Dimensions of real scale because it isn’t based on a real product so I can’t calculate presicely a scale. wich scale is this Forklift. admin you can repair the parts lists ? Yes, it works really well. Today I will deconstruct the forklift. I will shot a detail photo of the modified gear section. Great ! Does it work well ? Here is a picture of my version regarding the gear section. yesterday I rebuild of your forklift. It`s working really fine. I changed the differential section, because I have only bigger differentials than you. In which pack is this small one included? Hi, may i know what kind of remote are you using for this forklift? Hello Christian, as you can see on the inventory at en end of this article, the parts are very mixed so I propose you to download the PDF file of inventory and to check all part with your parts. Regards. What set do I need to have to build this forklift?